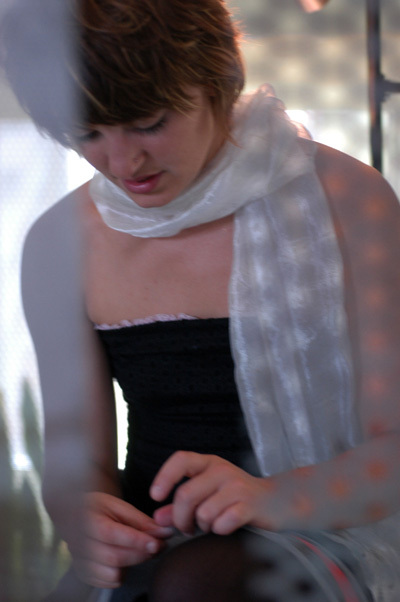 Although still under 30, Anais Mitchell is attracting a lot of attention. After winning the Kerrville Folk Festival New Folk award in 2003, she recorded an album for Waterbug Records, "Hymns For The Exiled," that captured devoted fans and critical aclaim. Now she's been picked up by Ani DiFranco's label, Righteous Babe Records, with her "Brightness" CD to be released in February. Anais has a distinctive and compelling voice, and she weaves wonderful stories together in her skilled songwriting. Don't miss this opportunity to hear this marvelous new talent! 1. Take 279N (parkway north) and get off at the Perrysville Ave Exit. 2. Turn right at the stoplight and go about a mile and one half. 3. Turn left on Dunlap. We are on the left hand side of the street.